I have to admit, it was almost a relief to see The Walking Dead return to its stumbling, brainless ways last night. For those still scarred by a lost second season spent mucking around a barn, these past few episodes — all stabby momentum that pulsed and gushed like a slashed jugular — were disconcerting. Many of the fundamental problems that nearly derailed the show were still present, of course: the draggy dialogue, the unpleasant personalities, Hershel. (When I say “derailed,” I mean critically; not even Cousin Oliver water-skiing over a shark could kill the ratings, provided the shark was also a zombie.) But replacement showrunner Glen Mazzara did the smartest thing possible and sprinted right through them, cutting and running and then dancing us to distraction in the thick, arterial spray. It was actually a trick Frank Darabont suggested early in the first season and it was wisely echoed by a gimpy Michonne last night: Cover yourself in enough gore and not even a horde of angry bloggers monsters will be able to notice how injured you really are. But as fat Otis demonstrated so gruesomely a year ago, you can’t run forever. And when The Walking Dead slows down, that’s when the wheels tend to come off the Hyundai. Listless and unsatisfying, “Hounded” was a sorry old dog, and it brought with it even older tricks. Not just the one where you use zombie intestines as a loofah to throw other walkers off the scent, but all the hoary narrative saws I had hoped were left smoldering in the ruins of Hershel’s piety-shack. Like Neal, for instance, who had “redshirt” written all over him long before his buddy Tim bled out all over his flannel. I understand the need to have fresh meat around; it’s the same reason the Romans stashed all those Christians near the Coliseum. But I’m not sure which was more unbelievable: that Merle would bring Miranda July’s twee boyfriend along on a hunt, or that the doof would go from panic-vomiting to gung-ho macho-man in the time it takes Michonne to shish-kebab a noob. 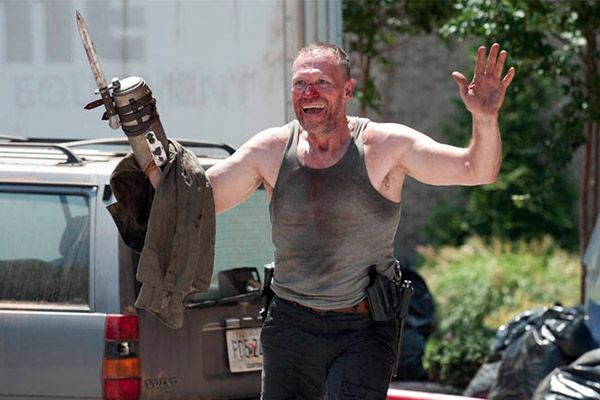 Merle putting a bullet in his floppy head was neither surprising nor necessary; it taught us absolutely nothing about either character that we didn’t already know. Actually, the whole hunt was like that, too. Why are they bothering with Michonne, anyway? From what I remember, she took off last week in a huff with nothing but her swords and a burning desire to head toward the ocean (presumably to glower at it). Arranging dismembered zombie corpses into warnings is, like most things on The Walking Dead, something that looks cool but is ultimately a waste of time. If the Governor wanted Michonne dead, then why did he let her go? And if he’s scared of leaving her alive, the only question is why. She clearly has no interest in returning, and the odds of her raising a possum army fearsome enough to storm the gates of Woodbury are slim, especially with Daryl’s appetite being what it is. I’ve been a Michonne defender these past few weeks, mainly because Danai Gurira’s performance is physical and charismatic in a way that sets her apart from the rest of the chirping herd. But I’m starting to get a little Abraham Lincoln vibe from her enforced silence. Are the writers merely high-fiving fanboys, still flush with the inherent coolness in a personality-free African American killing machine? Or is Gurira’s chopping just that much stronger than her chops? Either way, playwriting prizes are starting to seem a whole lot more fun. And then, of course, in true Casablanca fashion Merle somehow wanders into the same abandoned strip mall as Glenn, Maggie, and his katana-wielding quarry. (Merle: What happened to going back home? You shot a dude in the face and then felt like taking a longer stroll?) I’ve been thinking a lot about how The Walking Dead made a fairly explicit choice not to concern itself with the big picture: Other than spotty Milton, there are no characters dreaming of “curing” the crisis and saving the world. Jenner’s exploding act at the CDC pretty much put the kibosh on hope. So, fine: The Walking Dead is about survival, not salvation. But even if the show’s not going to go big, I desperately wish it wouldn’t settle for being so small. Woodbury, the prison, the surprisingly well-stocked baby supply stores: All seem uncomfortably close to one another, making an already claustrophobic show feel cramped and awkwardly coincidental. “Claustrophobic” and “awkward” are far too generous adjectives to use to describe the skeevy, shirtless shenanigans of the Governor and Andrea. How many episodes did it take to undo all of the positive changes in the sharpshooting civil rights attorney? After a promising, between-seasons idyll with Michonne where the former annoyance seemed reborn as a hardened Louise to Michonne’s vicious Thelma, she’s now been re-retconned back into her old self. Last season she made googly eyes at the sadistic Shane while rolling them at wise Dale. Now she’s in the exact same position(s) with another powerful, untrustworthy man. Calling the pasty Governor “Philip” doesn’t make him less ooky, nor does it make him more compelling. As of now he’s merely a horn-dog placeholder where a more exciting character should be. He’s got heads in the closet, Andrea in his bed, and a wicked tee shot. But he does not have our interest. And, hardhearted though it may sound, neither did Rick’s psychological bottoming out. The delusional conversation that somehow alleviates emotional anguish is low on my list of television clichés, just below dream sequences and ahead of judgmental pets. And so not only was it quickly clear that Rick was having a fevered parlay with his own grief-wracked mind, it was also plain that this was supposed to be a Moment of Great Import, when the post-digested ghost of Lori officially forgives Rick for not forgiving her for sleeping with another guy that one time and, thus absolved, sends him on his not-so-merry way. Good for Rick, I suppose, and at least it got him to embrace his baby. (“Looks just like Shane!” said no one, but thought everyone.) But when a guy rocking a goofy ponytail like Hershel can throw you the side eye, you know you’re acting plenty nuts. Mazzara has gotten a lot of credit for his triage-like response to the audience’s frustrations with the show he inherited. But is it possible he went overboard with Lori? Not only did she receive the most brutal offing in television history (nice try with the sympathy, Daryl, but it’s not like you jammed the Virginia Slim into your mother’s mouth while she was bleeding out of a gaping stomach wound), but she wasn’t even allowed the chance to settle her own scores. Instead we got Rick’s sappy imaginings of what she might say to him intercut with helpful wide shots of the distended belly of the monster who ate her. (A zombie I’ve nicknamed “The Will of the Internet.”) I would have much preferred to see Rick and Lori hash things out while separated by something plausible, not a plot contrivance. But The Walking Dead doesn’t go in for character work and it’s certainly not much interested in subtlety. (You can determine Rick’s sanity by his level of grime. Miraculously showered = good to go!) And so “Hounded” nudged the story along but basically everything remains as it’s always been. These characters are stuck in hell. And heaven has lousy cell phone reception.